The new Delta model fully lives up to the Lancia tradition by achieving a significant step forward in the field of technological innovation applied to driving dynamics, safety and travelling comfort. The best example is the adoption of the latest-generation systems and devices -some introduced for the first time in this segment -that are capable of transforming even the shortest of trips into a satisfying journey. The Lancia Delta has been designed to obtain the top score in passive and active safety tests due to the introduction of 6 airbags (front, window-bag and side bags, all fitted as standard throughout the range), three-point seat belts with pretensioners and load limiters. The new model also comes with the most sophisticated systems for electronic control of dynamic vehicle behaviour, namely ABS with EBD, the latest development of the ESP system (termed the Absolute Handling System) and ‘active electronics steering’ (DST). To ensure greater mastery of the car, the Lancia Delta also offers the ‘Absolute Handling System’, a development of the ESP (Electronic Stability Program), a system that cuts in under near-limit conditions when car stability is at risk and helps the driver to control the car. The following are also combined with the Absolute Handling System: a Hill Holder system that helps the driver on hill starts; ASR (Anti Slip Regulation) that optimises traction at any speed with the aid of the brakes and engine control; and the MSR system (Motor Schleppmoment Regelung) that cuts in in the case of abrupt driving changes during down-shifting to restore torque to the engine. The Absolute Handling System fitted to the Lancia Delta is an advanced system because it introduces some extremely important functions, namely, for example, LTF (Linearization Torque Feedback) and TTC (Torque Transfer Control). The new control system also always cuts in unobtrusively because it is combined with DST (Drive Steering Torque), an active electronic steering system that makes corrections automatically and also controls oversteer over surfaces with low grip. In detail, DST (Drive Steering Torque) is an innovative system that improves both driving safety and handling performance. Under all driving conditions, the electronic steering system suggests the correct manoeuvres to be carried out to the driver to allow outstanding road holding performance while instilling a great sense of security. This is achieved through continuous interaction between the electric power steering (which generate torque at the steering wheel) and electronic control of dynamics (Absolute Handling System). In detail, the DST automatically makes corrections, helps to maintain vehicle control and ensures that the Absolute Handling System cuts in more unobtrusively. Another specific feature of the Lancia Delta is its new TTC system (Torque Transfer Control) that improves the transfer of drive torque to the wheels and, in particular, guarantees excellent cornering behaviour thus making the car safer and more entertaining during a sporty drive or when grip is poor. In detail, the TTC System is based on the principle of making full use of the braking system that, when appropriately controlled by the Absolute Handling System control unit, develops a form of behaviour very similar to that of a limited slip differential (in other words, the TTC System electronically stimulates the presence of a self-locking differential). More specifically, when accelerating on a bend, the front braking system acts on the inner wheel to increase traction on the outer wheel (bearing the highest load) and thus distributing torque between the front drive wheels in a continuous, dynamic manner according to driving and road surface conditions. The suspension configuration fitted to the Lancia Delta makes use of a tried and tested structure that has also been optimised for comfort and lightness: MacPherson strut system at the front with a mechanical beam and wishbones optimised for the new load conditions; a torsion beam and anti-roll bar configuration has been chosen at the rear in order to achieve excellent handling performance. The real breakthrough on this model has been to introduce a feature produced in conjunction with some Magneti Marelli: The innovative system for damping fluctuations (Reactive Suspension System) until now reserved only for the very latest cars in higher segments has now been applied for the first time by the Fiat Group to a mid-segment vehicle. In detail, the Reactive Suspension System can reduce vehicle body fluctuations under all driving conditions to allow the highest levels of safety, comfort and handling by means of real-time electronic control of the shock absorbers. More specifically, the sis able to identify the driving scenario and road surface conditions by means of a set of sensors and this choose the most appropriate control rules. These include a function referred to as the sky-hook that allows the passenger compartment to be insulated by essentially making it resistant to external interference. Due to the high computing capabilities of the electronic control unit and the instantaneous response of accurate solenoids, the system also stamps out disturbances from an irregular road surface at source and allows outstanding dynamic control even during the sporty driving (selectable) to increase handling and manoeuvring accuracy. Last but not least, the ‘reactive Suspension System’ reduces the cars braking distance (by approximately 5% due to the effective contact between wheel and ground) and ensures fast action in the case of emergency manoeuvres with consequent easy recovery of safety conditions. A moment of distraction or sleepiness: Two situations that represents a potential risk of the driver leaving the road. The Lancia Delta reduces this risk by offering the ‘Driving Advisor’ system, a major preventive safety feature that notifies drivers when they inadvertently stray too close to the edge of the lane. The system is active when the car is travelling at a speed of between 65 and 135 Km/h and sends torque to the steering wheel (4 Nm on a continuous strip, 2 Nm on a discontinuous line) to attract the attention of drivers who cross the demarcation line. In detail, the main element of the ‘Driving Advisor’ is a viewing system consisting of a TV camera with image-processing software that sends data on the geometry of the road in front of the vehicle as it is driving (up to 20 metres in front of the car). The viewing device recognizes the lines that the limit the lane and provides a measure of the vehicle’s position in terms of displacement from the centre of the lane and in terms of orientation. The second key element of the ‘Driving Advisor’ at is the processing control unit with proprietary control strategies that extrapolate the vehicle’s trajectory and assess whether it is imminently about to leave the lane. This forecast is carried out on the basis of data from the viewing system and also from the standard dynamic sensors present on board the car. The control unit then defines the implementation command to be applied to the steering system. A sensation of stiffness slightly opposing the car’s crossing of the lane edge is then transmitted in the form of a torque perceptible at the steering wheel. The third element of the system is the electric steering system, with its activation motor and steering wheel torque and angle sensors required for correct operation: this device is responsible for implementing the torque request from the control strategies. 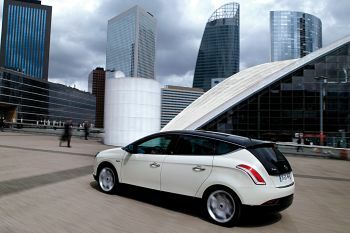 Certain features of its operation make the interaction with the driver effective and intuitive. As long as the vehicle is driving well away from the edges of the lane, the normal perception of steering wheel resistance is unchanged. Neither does the system cut in if the direction indicator has been operated because this is an indication of the intention to carry out a manoeuvre to leave the lane. If a torque is generated on the steering wheel, this provides an indication of the steering action to be carried out in order to take the vehicle back to its position within the lane. The ‘Driving Advisor’ therefore sets out to prevent situations due to the driver’s lack of concentration. The key aspects of the system is its natural and intuitive interaction, with information that is immediately interpretable and understandable without the need for elaborate reasoning. This benefits speed of response and reduces the cognitive load. Last but not least, the torque generated at the steering wheel does not simply prevent the car from crossing the side lines but also provides an indication of the steering action to be carried out to restore the vehicle to the centre of the lane and thus correct the drive trajectory. The driver nevertheless maintains full control of driving and is always able to oppose the torque on the steering wheel if considered advisable. The Lancia Delta is a bearer of new technology in terms of its engines and also in terms of the electronic systems it employs to ensure on-board comfort and wellbeing. The best example is the new generation of the ‘Blue&MeTM’ system, making its debut on the Lancia model and adding major new features to aid musical enjoyment. Customers are also be able to equip their Delta with ‘Blue&MeTM Nav’, an extremely effective pictogram navigation system that allows access, amongst other things, to a set of simple, useful on-line systems at the best price on the market (Lancia Delta is the first car in the Fiat group to offer these services from the time of launch. Other major devices and systems designed to maximize driving satisfaction are also available: from the new ‘Instant Nav’ satellite navigation system to Easy Parking and new front and tail-light clusters. The Lancia Delta may be equipped with “Blue&Me” (also with a Nav version), an innovative created as a result of a joint venture between Fiat Group Automobiles and Microsoft that changes the paradigms of in-car communication, information and entertainment to improve comfort and the quality of time spent on board. The device is extremely simple to use, and allows you to make/receive telephone calls and to listen to music simply and safely as you drive. And thanks to Bluetooth® technology, you can also communicate with the outside world from the car using your own personal devices such as mobile phones or handheld computers. The Blue&MeTM is also based on a system that is always able to keep pace with the times, with updatable, flexible and modular features. Fiat Group Automobiles and Microsoft, with the support of Magneti Marelli, also offer a platform that can be adapted to most mobile phones, music players or other personal services to replace the current costly and rigid hardware with the great benefit of being able to constantly keep pace with market innovations and maintain perfect integration with the car. All at a very accessible price. The Blue&MeTM system also ensures the greatest safety and ease of use. Because the voice control system is fully integration with keys on the steering wheel and information on the instrument panel display, customers equipped with a Bluetooth® mobile phone can use it even if it is in a jacket pocket or handbag without ever taking their hands off the steering wheel. Not to mention the fact that ‘advanced voice recognition, allows immediate interactivity -no voice learning stage is required - and also allows incoming texts to be read out. On this very car, i.e. the new Delta, the Blue&MeTM achieves a further step forward by adding new functions that confirm the platform’s great flexibility. By connecting the digital device to the USB port, it is possible to listen to hours and hours of digital music in MP3, WMA and WAV format recorded on mobile phones, MP3 players and USB then drives. The greater compatibility with your i-Pod, it is now possible when in your Lancia Delta to listen to music tracks with an AAC extension in addition to the above formats provided they are free from digital rights (DRM) and saved in Hard Disk Drive mode. And more. For greater passenger comfort, the Lancia Delta Blue&MeTM also displays information on music tracks on the radio display (they were previously available on the control panel). Lancia Delta can also choose to equip their car with Blue&MeTM Nav, and that includes a navigation kit consisting of a USB drive containing the stored maps and a backup CD that may be used to transfers the maps to personal MP3 players. The Nav key has a direct connection to the navigation menu, that may also be accessed by means of steering wheel controls and voice commands. When the USB key is inserted, navigation may be started. The destination may be entered by selecting the initial letters of the address using the steering wheel controls, which may be completed using voice commands. Like the other information, navigation details are also available on the vehicle control panel: Address of the destination, pictograms of the direction to be followed, arrival information, points of interest together with conventional voice instructions providing information on turn-offs through the car speakers. Unlike normal devices (that do not allow you to navigate and listen to music CDs at the same time unless a CD changer is fitted), with Blue&MeTM Nav it is possible to navigate and listen to music on your media player with the greatest ease while still remaining connected to your mobile phone. 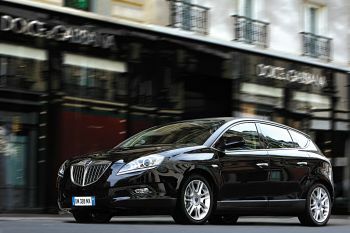 The Lancia Delta is the first of the Fiat Group models to offer on-line services developed in partnership with Telecom Italia and available on the Blue&MeTM Nav system (SOS Emergency, Info Service and Drive Me and on-line Insurance Services) that may be activated with complete freedom by the customer. ‘SOS Emergency’: The SOS emergency service, available 24 hours a day, 365 days a year, is activated by pressing the SOS button: In this case, a call and a text message containing the car’s position are forwarded to the operating centre. Whatever country customers are driving through, the call centre operators are able to put them at their ease by answering them in the same language. The service also activates automatically if an airbag is set off. The vehicle will quickly be located and roadside and medical assistance will be available. The SOS may also be used in the event of illness or danger. These services will be free of charge during the car warranty period (after this they will be available by paying an annual subscription). ‘Info Service and Drive Me’: Information at the service of the motorist. Wherever you go, it will always be easy to obtain assistance and up to date information on events, traffic conditions, restaurants, cinemas, night spots and much more in no fewer than five European countries: Italy, France, Great Britain, Germany and Spain. All you have to do is press the INFO button to speak to a dedicated operator who will answer all your questions or, if you prefer, send the coordinates of the chosen destination to the navigation system (at this point, the device will automatically compute the route. The INFO services will be ‘pay per use’ (the cost will be based on seconds of conversation with the service centre) and, an important feature of this system, no annual subscription be required: The cost is 2.4 Euro cents per second (1.44 euro/ min), plus 30 cents for each call answered. On-line Insurance Services due to the satellite location system and agreements with most of the insurance companies, it will be possible to benefit from discounts on civil liability insurance (up to 20%) and also fire and theft insurance (up to 50%). If your car is stolen you will be up to trace it by tracking. It will also be possible to establish how many kilometres will be covered by the car and, on the basis of this figure, take out ad hoc insurance policies that are more advantageous because they are based on the customer's true habits and requirements. As an option, the Lancia Delta may be equipped with ‘Instant Nav’, an innovative latest-generation on-line system that incorporates a map satellite navigation system, a dual tuner, a radio set and a CD Mp3 player in the form of a single device built into the dashboard; because it is also compatible with Blue&Me, Media player functions can also be provided in its presence by connecting pen drives, iPods etc. to the USB port and Bluetooth handsfree sets for a personal mobile phone. The device, produced by Magneti Marelli, is positioned in the centre of the dashboard and is equipped with a 6.5 inch colour screen in 16:9 format that is bright and sharp enough to allow feasibility under different light conditions. Due to the width of the display and an area for zooming in on road crossings, the radio navigation system simplifies your understanding of the most complex driving instructions, making life much easier for the driver. ‘Instant Nav’ is a telematic product designed to make technology available to drivers, through easy interaction with controls and functions, to ensure in-car living is even more comfortable and easy while you are en route for your destination. Route calculation algorithms have also been optimised by making use of the speed of access to the map database, now stored on an SD (Secure Digital) card in an appropriate slot. Another special feature of this system is the addition of a dual tuner that makes use of diversity technology for optimum tuning of stations and for the reception of traffic information on the RDS-TMC (traffic message channel). If you order ‘Instant Nav’ together with Blue&Me, you can display details of an incoming or outgoing call (including text messages) in addition to the telephone number and name associated with the number in your address book plus the reference details of the telephone currently connected via Bluetooth as a result of the resulting operational integration. The level of integration achieved have also allows the passenger to manage some phone functions phone functions and also Media player functions, allowing information on the audio tracks present on the electronic medium connected to the USB port, such as title, author, etc. to be shown on the colour display and also allow the passenger to manage playing. It is often difficult to find a suitable parking spot in a town or city with high traffic density. Not to mention the fact that once you finally find a place the parking manoeuvre may be quite difficult if the available space is tight. The Lancia Delta therefore comes with an innovative parking aid system that tells drivers whether a parking space is big enough also helps them carry out the actual parking manoeuvre. As an initial stage, the system measures the length of the free space and indicates whether it is large enough for your car. This system then automatically as does the vehicle as it reverses, leaving the driver only with the task of adjusting speed by means of accelerator and brake. The vehicle is therefore parallel parks in a single manoeuvre, optimising parking in the free available space in order to limit the number of subsequent vehicle alignment manoeuvres by the driver. The driver naturally has full control over the entire operation by means of the pedals and can deactivate the system by operating the steering wheel or disengaging reverse or alternatively by pressing the dedicated button. In detail, the heart of the system is a radar sensor installed on the right side of the vehicle inside the front bumper. The radar beam is sent into the space to the right and the echoes are picked up by the sensor, which reconstructs a map of the area between the parked cars, ‘sees' free spaces and identifies any other obstacles. In parallel, the system is able to measure the length of the free areas on the basis of information obtained by measuring the speed of the wheels. The driver is informed of the presence of a suitable parking space when the measured length is compatible with the size of the vehicle (the space must be at least 5.30 metres): An acoustic signal indicates that a suitable space has been detected and a display indicates whether the parking manoeuvre may be carried out in one or more stages. If the driver considers that the parking area identified is suitable and engages reverse, the system is able to control side movements of the vehicle by means of the electric steering system, allowing the driver to take his hands of the steering wheel and control vehicle motion exclusively using the accelerator and brake pedals: During this stage, the maximum permitted speed is 7 km/h and all the driver needs to do in order to stop the system working is to resume control of the steering wheel. 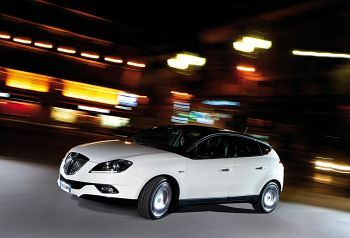 The Delta’s headlights and tail lights are produced by Magneti Marelli Automotive Lighting and a remarkable for their high-tech content combined with an innovative design that is also inspired by age-old Lancia tradition. Both devices are fitted with LEDs the that offer greater brightness than conventional bulbs for more safety plus their own distinctive good looks: When they are off, they look as though they are one colour but when they are on, they assume different colours according to the different functions performed due to the led light emission. 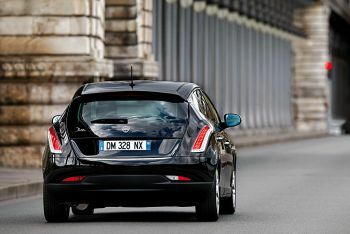 In particular, the front headlight offers a daytime light function (Adaptive Daytime Led) that automatically turns on the sidelights when the is started up: It should be emphasized that this function complies with the specific European regulation that is due to come into force in 2012. The Lancia Delta’s stylish and technologically cutting edge headlights are available in two versions: The first with halogen bulbs, the second with xenon bulbs and ‘Adaptive Xenon Light’ function. In the latter version, the low/high light beam is produced by a device based on xenon technology and equipped with automatic vertical correction to prevent glare and horizontal rotation when cornering Adaptive orientation of the lights when cornering - a function termed ‘Adaptive Xenon Light’ – is carried out by means of a state of the art electronic control system fully integrated in the C-CAN network. The light beam follows the controls imparted by the steering system, performing irritation to apportion alter the radius of curvature of to a maximum of 15° and allowing the vehicle cutting edge levels of driving safety. The front fog lights on the Lancia Delta are also equipped with an additional ‘fog-cornering’ function. In detail, the light parabola is extended up to 70°, allowing optimum visibility, particularly on bends: In this case, the foglight located in the direction of the corner turns on automatically at low speeds after exceeding a given steering angle, activated by the vehicle electronic control unit. The clear lens and very bright reflector also enhance the appearance of the foglight.